This interview was conducted by electronic mail. Questions were composed by the Hammer’s multimedia fellow Sasha Mann. 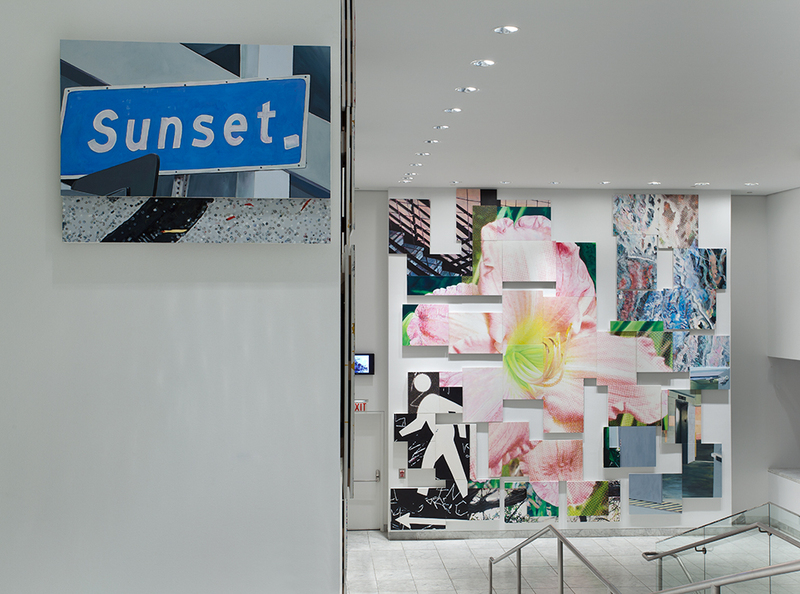 For his Hammer Project, See This Through (2009-10), LA painter Mark Flores walked the length of Sunset Boulevard during several long journeys across the city, taking photographs of both natural and man-made phenomena. His photographs then became the basis for the paintings in this exhibition. Read more here in an essay by curator Anne Ellegood. SM: Why did you decide to walk the entire length of Sunset? What does this Boulevard represent to you? Can you describe what it was like, how long the walks took, and what sorts of things occurred during these walks? MF: I had done other walking work in the past and wanted to refer to the street that was suggested by the exit located in the center of the stairwell project space. I've lived close to Sunset Blvd. for over 10 years, so there was a connection. I approached the walks themselves in a casual way. I didn't want the work to be over-informed by art history, but I acknowledged its presence. There is also a tabloid culture that exists along Sunset, for example, the spot where River Phoenix passed away, the public restroom where George Michael was arrested for lewd conduct, and the driveway where Helmut Newton died. With that in mind, I wanted to find details that are less sensational and moments that reveal themselves when walking rather than driving. The walks usually took 9- 12 hours. SM: After completing the traversing stage of your project, do you feel differently about Sunset Blvd. and what kind of environment it is? MF: Like many major streets in Los Angeles, Sunset is constantly changing. This is something I think about. Having walked its length a few times, I feel like I know it but realize it isn't always the street I remember. I was made aware of how pedestrian unfriendly the city is. There are sections of Sunset that have no sidewalk and bus stops that are covered in ivy. SM: See This Through plays with scale and composition. Many images are blown-up, or seem like deconstructed representations of the things you photographed. What role does abstraction play in this project? MF: I think the paintings are abstract in the sense that they reflect decisions that my eye, hand and body made in the realization of the work, often giving an impression rather than an accurate portrayal. This is complicated by the contrast with the halftone painting, which should and does reflect a photographic precision from a distance but up close falls apart. SM: How did you choose which photographs to incorporate into See This Through? MF: The oversized space of the Hammer's stairwell tones down bold brush strokes, so I was looking for the composition to pick up the slack. This was part of my decision process. I wanted images that lead the eye and then the body through the space. This is also a reason for the modular approach to laying out the work. It engages the eye and asks the viewer to fill in some of the blanks. SM: Do any of the pieces represent more than one photograph? In other words, do you conflate images? MF: No, each section depicts one photo. One image shows a reflection that looks like a composite image but isn't. I was thinking about collage with the composition of the work and how it could be played with or expanded. SM:Anne Ellegood tells us that for one of your painting techniques, you replicated the photographic printing process (cyan/magenta/yellow/black). Can you describe this process? And can you also talk about the other painting techniques that you use in the exhibition? 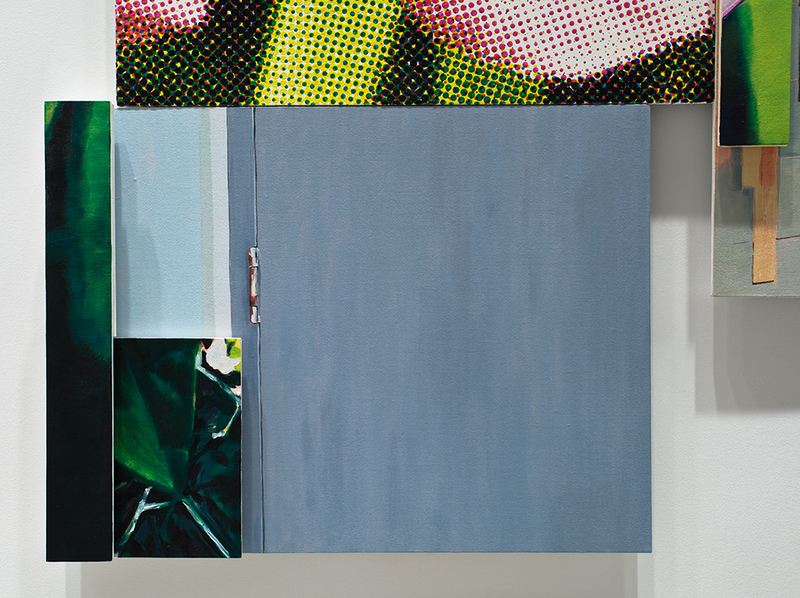 MF: The halftone paintings are created much like the printing process, with each transparent color layered on the canvas separately. I like the way a mechanical approach to painting opens up a dialogue about image making, the idea of one thing in front of another is expanded in the layering of the paintings and the way the installation sits in the space. SM: How do you approach your use of color? In the past I've made work that explored the history of color theory, particularly the work of Joseph Albers and Johannes Itten during their time teaching at the Bauhaus. As I was doing the halftone paintings my normal palette was pared down to a tight selection of paint. This facilitates mixing and returning to colors. SM: You use painting, which is obviously an older medium, to evoke photography - especially digital photography. How do you see the relationship between photography and painting? Is there a playfulness in rendering a digital "looking" image in a traditional medium? MF: I think about how digital photography has changed the way photos are taken. Taking photos engages the hand and body with the shift away from the viewfinder to the digital display. Physical decisions were part of how the photographs were shot. This is echoed in the painting process. SM: Did you hope for a trompe l'oeil to occur? Or is there a more subtle intention behind the photorealistic quality of your work? I didn't think I could achieve trompe l'oeil with my approach to painting but was conscious of the way the work allowed the eye to read an image. SM: How did you choose to render this project the way you did? Did the concept come first, or did you already have a technique/process in mind that needed a concept "vessel"? I knew I wanted to see how I could work through painting. I originally composed the work on a laptop and must confess that this approach made the project seem easy and simple, but it really wasn't. The way the painting developed in the studio was always changing. Space constraints didn't allow me to grasp how the entire piece would play out. I didn't see the entire work until it was on the museum wall. I liked not knowing until it was done.